Are you getting tired of the color of your new aftermarket wheels? Did your car come with chrome wheels out of the factory, but you hate chrome finishes? Are your OEM wheels looking worn out and old? These are all great reasons to freshen up your wheels with our custom powdercoating services at our Pomona, CA location. Why spend more money on new wheels when you can get a new vibe with a fresh new powdercoat. Powdercoating is a process similar to paint, but powdercoating your wheels is a lot more durable than regular paint. Paint will always be susceptible to chipping and flaking with age because it’s just sprayed on. Powdercoating is a whole new new process where the finish is cured under high temperatures to ensure the coating stays on for a very long time. Call us today to get more information at (909) 784-1899. Powdercoating is perfect if you have wheels that have curb rashes and you want to make them look like new again. Since we have to prepare your wheels for the Powdercoating process, your wheels will get sanded down, which will get rid of all those nasty looking curb rashes. Then with the powdercoating process, your wheels will look exactly like they did from the showroom floor! We know there are tons of DIY paint touch up kits for wheels, but at the end of the day, you’ll be spending almost the same amount of money and time for a very sub-par job. Do it right the first time and let the professionals take care of it with our custom powdercoating services. Did you spend thousands of dollars a year or 2 ago on a nice set of aftermarket wheels and now you’re getting that itch to modify your car again? Don’t spend more money! Powdercoating your wheels costs a FRACTION of new wheels and you’ll have something custom suited to your liking. 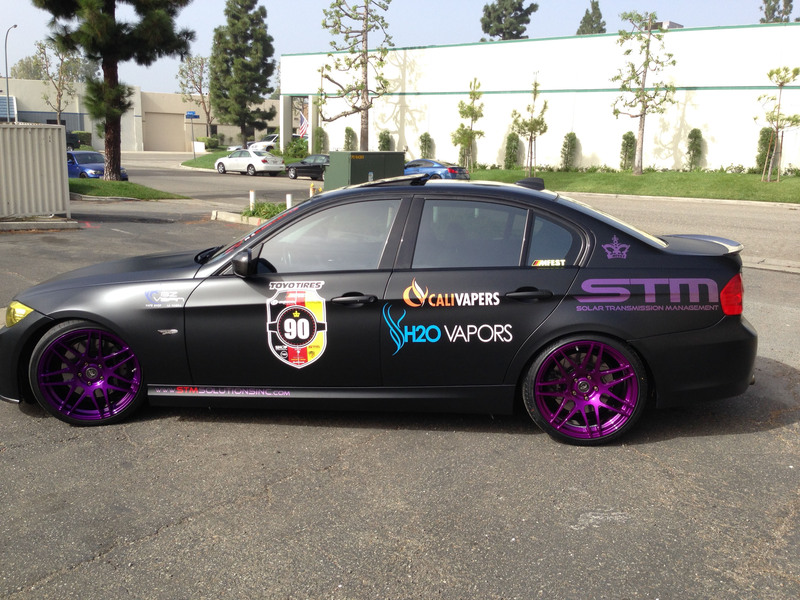 Check out the pictures below of one of our team member’s 2009 BMW 335i. His wheels started off Matte Black, then changed to Neon Yellow, and now powdercoated to a metallic “Laker’s” purple, all at fraction of the cost of the retail price of his wheels! Call us now for more information at (909) 784-1899 for powdercoating in Pomona, CA. This entry was posted in Uncategorized and tagged aftermarket wheels, CA, OEM wheels, Pomona by nitrousgarage. Bookmark the permalink.